Fri., July 27, 2018, 8:30 p.m.
LARUNS, France – Having worn the leader’s yellow jersey over the Alps and through the Pyrenees, only one more challenging stage stands in the way of Geraint Thomas winning his first Tour de France. Thomas takes an advantage of 2 minutes, 5 seconds over Dutch rival Tom Dumoulin into Saturday’s 31-kilometer (19-mile) individual time trial in the Basque Country. The pressure of leading has reminded Thomas of the time he helped Britain to the gold medal in team pursuit on the track at the 2012 London Olympics. While Dumoulin is the time trial world champion, Thomas is quite capable in the discipline and acknowledged he should be able to protect his advantage. He increased his lead after the final mountain stage on Friday, while Sky teammate and four-time champion Chris Froome lost his spot on the podium. Primoz Roglic of Slovenia won the 200.5-kilometer (125-mile) 19th leg through the Pyrenees with an attack on the dangerous descent from the Col d’Aubisque. A former ski jumper who rides for Team Lotto NL-Jumbo, Roglic finished 19 seconds ahead of Thomas, while Romain Bardet of France crossed third with the same time. 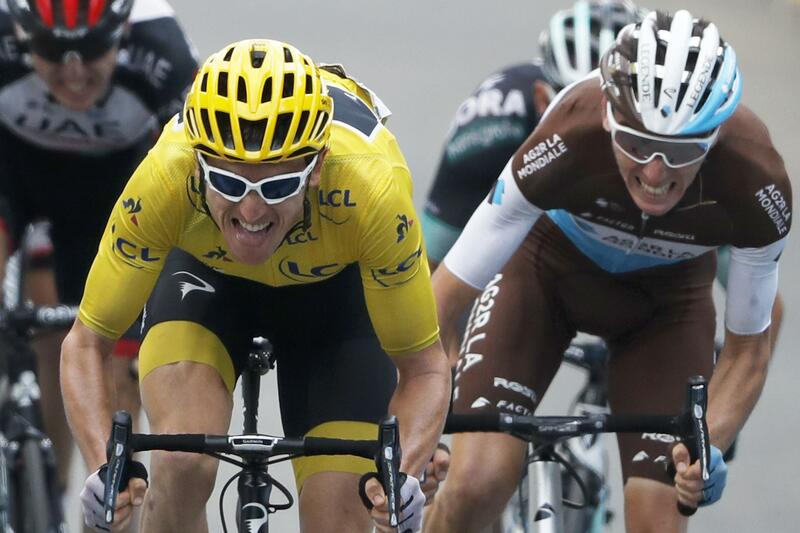 Thomas received a six-second bonus for ending up second, while Dumoulin finished sixth and Froome eighth, both with the same time as the race leader. Roglic leapfrogged Froome into third spot overall, 2:24 off the pace, while the defending champion now trails by 2:37. Froome initially fell behind on Friday’s climb up the Aubisque before latching back onto the lead group on the descent. Dumoulin accused the stage winner of `drafting’ behind a motorbike. “Roglic was the strongest today, and a lot of respect for his victory. But he was flying downhill, and eventually I got dropped on a straight part just because he was on his tube and full in the slipstream of the motorbike,” Dumoulin said. The route from the pilgrimage town of Lourdes to Laruns took the peloton over three legendary climbs – the Col d’Aspin, the Col du Tourmalet and the Aubisque – before the dive down to the finish. Published: July 27, 2018, 8:30 p.m.